Travel the Spice Markets of India with our new 3 Step Curries. Each curry is inspired by a different region; Punjab, Kerala and Madras and just 3 Steps can take your on a culinary journey. Simply fry the whole spices, add in the Spice Paste and stir in the rich curry sauce. The Punjab region of Northern India that is famous for its creamy curries inspires our Punjabi Tikki Masala. We have combined cumin seeds, green cardamom, bay leaf, fenugreek and dry chilli to bring you a rich Tikka Masala with deep rounded flavour. Why not try it with chicken thighs instead of chicken breast for more flavour? 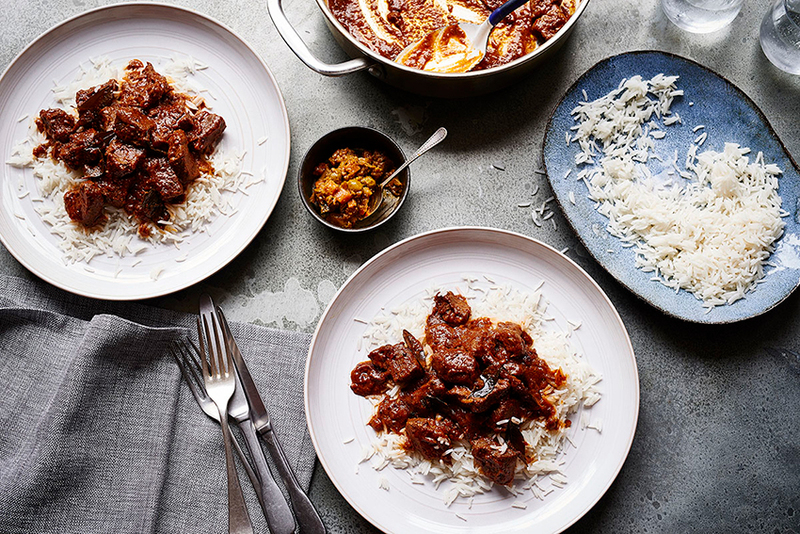 Serve with Basmati Rice and Naan Bread, a classic curry combination. Our Keralan Korma is inspired by the region of Kerala in Southern India. This coastal region is famous for its aromatic coconut curries. Star anise, cinnamon, cloves and green cardamom blended with the tropical flavour of coconut give this curry a rich yet mild flavour. Garnish your dish with some fresh coriander to bring some zingy freshness to this rich curry. Our Madras curry is inspired by the curries cooked in the city of Madras, now called Chennai, in the South of India. This region is famous for rich and spicy curries, flavoured with black pepper and tamarind. Peppercorns, Mustard Seeds, Cloves, Curry Leaves and Dried Red Chilli give this curry its fiery flavour. Serve with a cooling Raita to allow your guests to tailor their dish to their taste. We all love curry and there are three main ways to make one (let us know if you can think of any others). This page gives you a brief overview on each method, so have a quick look, then go to our recipe pages and start cooking! In the lead-up to National Curry Week (October 10th-16th) we wanted to better understand Britain’s love of curry so, we asked which curries you crave most. There is no busier time than back to school. We want to share our secrets to help you to feed your busy family a delicious dinner every night.